I did take a break from all of the catch up to bake Biscoff Pumpkin Oatmeal Cookies. A cookie break is the best kind of break…and I needed a good break! The cookies are super soft and chewy. The Biscoff Spread (a sweet and creamy spread made with Biscoff cookies) and pumpkin are a match made in heaven! I love the simplicity of this cookie recipe. You can go crazy and add in chocolate chips, white chocolate chips, dried cranberries, or pecans, but I really liked them plain and simple. 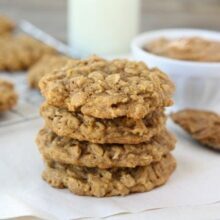 Take a break from your everyday “to do” list and bake a batch of Biscoff Pumpkin Oatmeal Cookies. And did you know October is National Cookie Month? So you pretty much HAVE to take a cookie break. I think it is a law. If you are in the mood to do some major cookie baking, check out my post at Cafe Zupas. 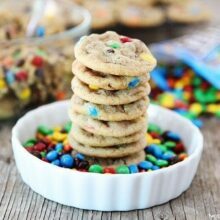 I am sharing my top 10 favorite cookie recipes. How did I pick only 10? You caught me. It is impossible for me to pick favorites when it comes to cookies, so I just picked 10 cookies that I am currently craving. The list might change in 5 minutes, but I promise the 10 recipes I picked are all winners! Check them out! 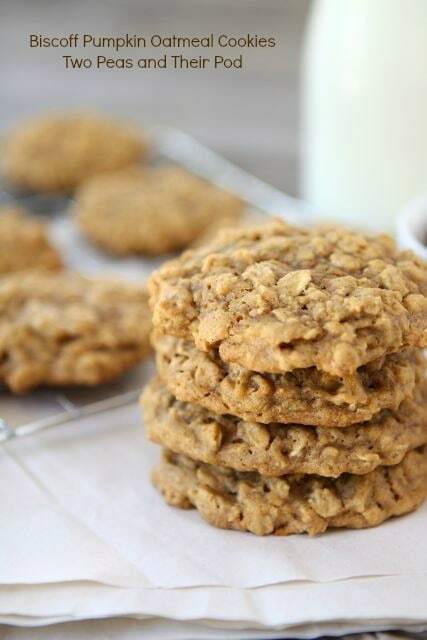 Soft and chewy oatmeal cookies with a hint of Biscoff and pumpkin! These are the perfect cookies for fall! Preheat the oven to 350 degrees F. Line a baking sheet with a Silpat or parchment paper and set aside. In a medium bowl, whisk together the flour, baking soda, cinnamon, nutmeg, ginger, allspice, and salt. Set aside. In the bowl of a stand mixer, add the butter and sugars. Beat until creamy and smooth, about 3 minutes. Add the pumpkin and Biscoff spread and mix until combined. Add the egg and vanilla extract and beat until smooth. Reduce the mixer speed to low and slowly add the dry ingredients, beating only until blended. Stir in the oats. Form the cookie dough into rounded tablespoons and place them 2 inches apart on the baking sheet. Bake for 10-12 minutes or until cookies are golden and just firm around the edges. Let the cookies cool on the baking sheet for 5 minutes and then remove with a spatula onto a cooling rack. 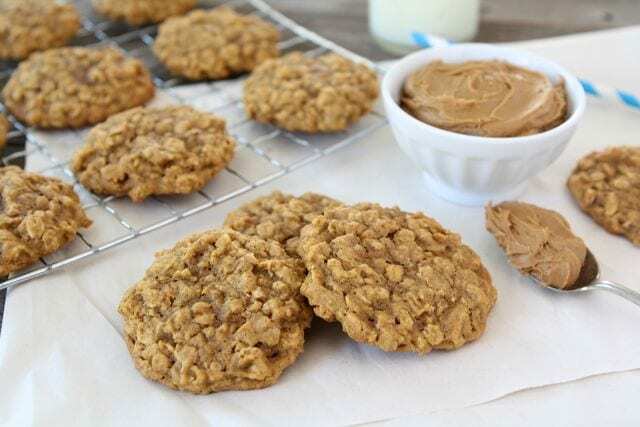 Maria these are everything I want in a cookie – chewy oatmeal, pumpkin…and Biscoff! They look perfect! Mmmmm Biscoff. You had me at Biscoff!! Wow, these cookies look delish!!! I would love one with my morning cup of coffee!! Am sorry did i miss where you said what Biscoff spread was? The cookies look absolutely delicious! Sorry, I’ve baked with it so much, I just figured everyone knew by now:) I am kind of obsessed:) Here is a link where you can buy it online: http://astore.amazon.com/twpeanthpo-20/detail/B004QKPCYE You can also find it at most grocery stores, look by the peanut butter. I know World Market carries it too. Trader Joes makes a similar spread-Cookie Butter. I hope that helps! Aimee took my line! lol……..you had me at Biscoff!! I made pumpkin bread and used the Biscoff spread, but what a great idea to bake it into cookies! Glad you guys had fun on your trip! Whoa whoa, Biscoff spread with pumpkin, I’m sold!! Wow, I couldn’t think of a better way to end the week! Oh my gosh. These look so good Maria! I am in the middle of a cleaning spree and these look like the perfect diversion! Such gorgeous cookies, Maria! I know they taste amazing! What a combination! These sound fabulous and they scream fall! Yeah, I bet that scent in a candle would be amazeballs! If you ever get into candle making, let me know! 🙂 These cookies are on my “must make soon” list!! Cool weather comfort food at it’s finest!! Glorious cookies Maria! Oh man. These are an addiction waiting to happen! I would so buy a biscoff pumpkin perfume by the way…would be amazing. I’ve made your Biscoff Oatmeal Cookies, and they really are fantastic. I bet the addition of the pumpkin just takes it to the next level. Can’t wait to try them! Oh yeah these look amazing!! Biscoff is not sold on or near the small military town we are stationed at, what do you think would be a good substitue, untill i can order some on line? This is super awesome! I love biscoff and cookies – what a perfect combo. I’ll be sure to take a break while enjoying this delicious cookies. So glad Caleb did okay with his shots! What a trooper. I remember the 1 year shots making my girl kind of wonky. Also, thanks for the go-ahead on the cookie break. I’m going to go do that riiiight nowwww. What an interesting flavor combo! I’ve never thought of biscoff and pumpkin together before, but now that you mention it…I bet it’s amazing! These cookies look so caramely or caramelie ( I think I’m just making up words), and chewy and perfect just the way they are! Pumpkin and oatmeal sound so good together! Yum! love a soft and chewy cookie – especially with biscoff in it!! Cookie breaks are the best! I’m not a fan of packaged spreads like this though, is there something I could substitute for the Biscoff? More pumpkin puree? These cookies look delicious! What a great idea! Yummy! You bake the best cookies! Yummy. Do you think this recipe would work substituting whole wheat flour for the all-purpose flour? 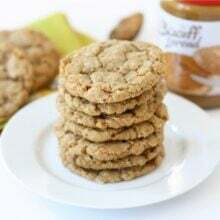 Oh yum – love Biscoff, and with oatmeal that sounds like the perfect pair! I’m making these as we speak! Going to try to mix by hand as my mix master is packed away. Have company coming for an afternoon tea so can’t wait to serve these to them. A scoop of biscoff has become my new favorite snack! 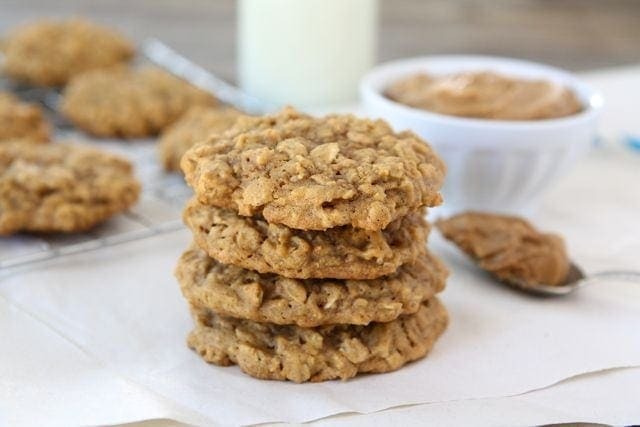 Oatmeal and pumpkin and cookie butter all in one cookie? Delish!! I baked these this weekend but with Nutella instead of Biscoff and they were wonderful!! Yummy! Can I replace pumpkin pie spice for the ginger and nutmeg? I want to eat cookies with every meal. Mmmmm and Biscoff. I think we have one more can of pumpkin puree left in our pantry. All we are missing is the biscoff. Next time we are in the store we are going to have to add it to our shopping list. My kids’ schools are polling places and are both having bake sales on Tuesday. 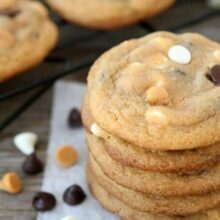 TOTALLY making these….and adding white chocolate chips! YUM! Just made these and they’re excellent!!! I need to get some more cookie spread. These sound so good. Love these cookies!! I prefer Biscoff to Trader Joe’s too, because the Biscoff spread isn’t processed with peanuts/nuts. Yay! I’ve found that I’m always wishing more people write about how the recipe turned out for them, so I have vowed to start doing that more myself! Just wanted to say that I made the cookies and they were delicious, however the biscoff flavor didn’t come through as much as I had hoped. 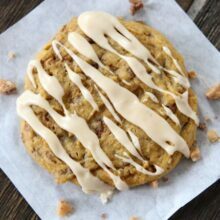 They just tasted like a lighter pumpkin cookie – obviously that did not stop them from getting gobbled up, and they were delicious with an afternoon coffee break! These cookies are awesome! I really don’t know how long the cookie jar will stay full. However, I’m looking for the nutrition info for a particular calorie counter. 🙂 Do you have nutrition info for these cookies made as is in the recipe? I was viewing the recipe using Biscoff spread where do I find it, I never heard of it. Is it something you can make? These sound divine. 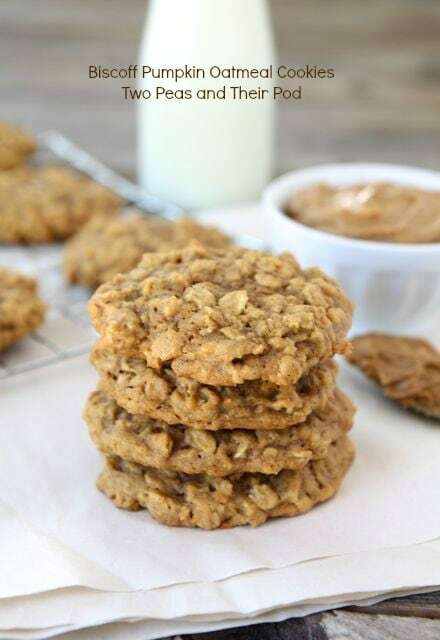 BUT, if you had to choose, would you make these or your original Biscoff Oatmeal Cookies? It’s boss’s day tomorrow and I don’t want to “waste” my Biscoff. ;o) Thanks for the delish recipes!! I personally like the original cookies better. They are in my top 5 cookie recipes of all time! I love Biscoff! I can’t keep my fingers out of the Biscoff Pumpkin Oatmeal Cookie jar! These are far too addicting for their own good. Hmmm.. how about a caramel creme brulee cookie using Biscoff? Made these today. I thought they were good…nothing too special (as I am a biscoff butter addict 🙂 I had hoped the biscoff flavor would be stronger). However, I took them to an event and they were a hit…everyone wanted the recipe. Apparently they are definitely a keeper!